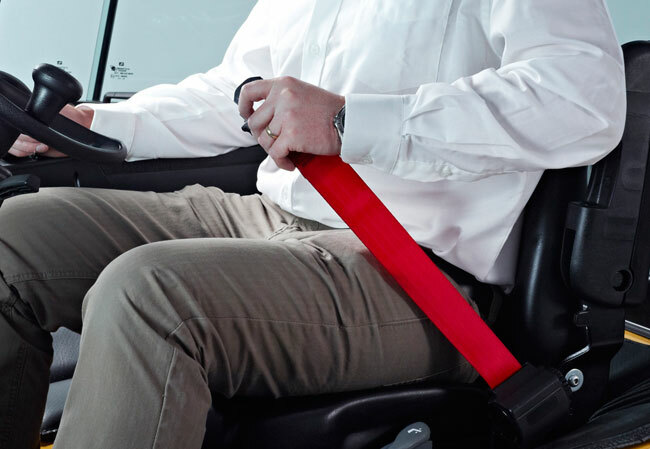 Forklift bosses will find it easier to monitor seat belt compliance with Hyster Electric’s new smart, high visibility seat belts for Hyster Electric and ICE counterbalance forklifts. Smart, in this context, refers not only to the chic red color of the new restraints. An optional interlock system automatically disengages traction if the operator unfastens the seat belt while driving. The truck eventually comes to a stop until the seat belt is re-engaged. Forklift safety lapses lead to a fatal workplace accident every three days. Nearly half of these fatalities, 42%, occur because an operator has been crushed by a truck tipping on its side. This typically happens because the operator has not been wearing a seat belt. Either they are not wearing one or instinctively undo it before leaping off the truck when they feel the truck tipping over. The intuitive response to jump is contrary to the safe, correct response, which is to brace oneself inside the vehicle. Because the safe response to a forklift that is falling on its side is counterintuitive to the natural, knee-jerk reaction to jump to safety, the message needs to be constantly reinforced until it becomes second nature. By making the new seat belt in red, not only does it serve as a visual reminder to the operator, it also makes it obvious to the shop floor supervisor which forklift operators are driving around with their belts unfastened. The interlock system, which prevents the lift truck from being driven while it the seat belt is not fastened, removes the possibility of the driver’s instincts from taking over in the event of a tip-over. While saving lives is obviously the whole point of using the new restraint, it will also help to avoid a crippling OSHA fine against the forklift employer for a serious safety violation.